Breakout – short squeeze or pump and dump? The markets gained a strong push yesterday after sitting more than a week at the resistance level of about $6000 USD. The break out surprised many traders. It is likely that shorters tried to even out their positions by buying Bitcoin etc. which is called a short squeeze. This caused prices to jump even higher which made the breakout seem even stronger than it actually was. Though many critics suspect that a pump and dump scheme is behind the recent push. In any case, the relative strength indicator suggested that the market is overbought. In the most recent hours prices (except Bitcoin’s price) did actually fall by a few percents. Shortly after opening a 20,000 square feet office in Silicon Valley, Bitmain announced today that they are going to triple their development center in Israel. It is Bitmain’s main development centre. The mining hardware firm is going to add 40 more employees to its current 15 according to Israeli business magazine Globes. Bitmain is the biggest company in its sector and is currently worth an estimated $13 billion USD. Venezuela recently made headlines with inflation rates as high as 25,000 to 40,000%. It sounds horrible as it means that goods become more and more expensive. But in practice it is even worse. Merchants do not accept the national currency anymore because everybody knows the Bolivar is likely going to decrease in value. So you either have to exchange goods or you have to rely on foreign money – or of course on cryptocurrencies. While cryptocurrencies dropped in value as well over the last six months, they still did not drop as hard as the Venezuelan Bolivar. Paxful will include a conversion rate calculator to its app to be extra helpful to its users. It is no secret that seemingly the whole nation of South Korea is enthusiastic about cryptocurrencies. National and private banks offer various services in the crypto sector, the governments regulatory framework opposes crimes of any sort that are related to crypto strongly. But so far it has a crypto-friendly stance in general. 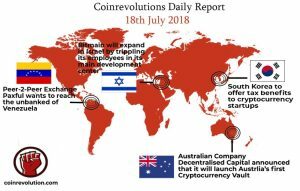 Now, the country shows that it is very bullish on cryptocurrencies. It announced that it will offer tax benefits to cryptocurrency startups. However, it is still unclear how much taxes startups in the crypto sector will save.